EuroBioBank is the first de facto biobank of RD-Connect. To develop the full potential of biobanks as indispensable aids to rare disease research, EuroBioBank helps to address the numerous challenges that they face and contributes both to integration between biobanks and registries and to development of legal and regulatory frameworks in rare disease biobanking. EuroBioBank (EBB) is a European network of biological banks established in 2001. The EuroBioBank Network is fully dedicated to supporting research into rare diseases by facilitating access to quality human biological resources (DNA, cells and tissues) and their associated data from patients with rare diseases. From 2003 to 2005, the EuroBioBank Network has received grants from the European Commission, under the European Union’s Fifth Framework Programme “Quality of Life and Management of Living Resources”. 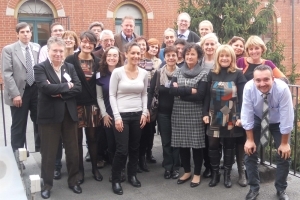 Its purpose is to expand by associating new biobanking members across Europe. The EBB network was the first operating network of biobanks in Europe to provide human DNA, cell and tissue samples as a service to the scientific community conducting research on rare diseases. Furthermore, the EBB has for long been the only network seeking to confront ethical, legal and social issues(ELSI) related to biobanking across European countries. In the absence of a unified regulatory framework, but by seeking professional guidance and applying professional values and culture, the EBB has been able to progress and contribute to the development of regulations as well as to establish a basis for international cooperation in RD biobanking.